There are 15 species of bats found in North Carolina. In the center of the state, the species most commonly found are tri-colored bats (this is also the smallest species in the area), big brown bats, and Eastern red bats. All of the bats in North Carolina are insect-eaters; they feed on mosquitoes and many agricultural pests. They eat a lot of insects too. A large colony of big brown bats can eat 18 million corn rootworms each summer, while a single nursing female bat can eat her weight in insects every night! During the summer, most bats roost either in colonies in trees (or in houses), or alone in the leaves of trees. During the winter, bats either migrate or they hibernate in large multi-species colonies in caves or mines. Pesticide use, persecution and human disturbance of hibernation and maternity sites have for years led to declining bat populations across the country. More recently, however, bats have been hit hard by a fungal disease known as White-Nose Syndrome (WNS). 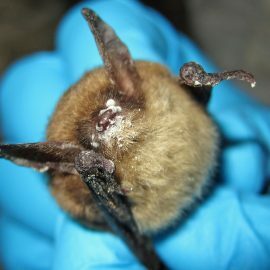 Named for the fuzzy whitish fungus that it causes to grow on bats' noses, wings, and ears, WNS first appeared in North Carolina when it was detected in Avery County [map] in Feburary 2011. Since then WNS has affected at least five species in 10 western North Carolina counties. Tri-colored, Northern long-eared, and little brown bats are affected the most; at some sites, more than 90% of a colony's bats have died. Infected bats typically do not survive the winter; rather than resting during the cold weather, they continuously wake up and, as a result, burn off essential fat reserves. The U.S. Geological Society has estimated that the loss of bats in North Americaand the resulting loss of the natural insect control offered by batscould lead to agricultural losses exceeding $3.7 billion annually. Bats are valuable beyond their role as insect-eaters, of course; that's why the North Carolina Zoological Park is part of this bat research project. Over the last few years, fieldtripEARTH has shared information about bat research in the United States. Jen Hicks Ross has reported several stories about her field work and, especially, about how White-Nose Syndrome (WNS) is affecting bat populations. Her reports from as far back as 2009 anticipated how important the fight against WNS would be today. Be sure to see her story The Problem of White-Nose Syndrome to better understand the history and purpose of bat research. Many agencies have begun working together to monitor bat populations. North American Bat (NABat) is a multi-agency, multi-national effort designed to address the need for standardized long-term monitoring of bat species in North America. The North Carolina NABat project is administered through the University of North Carolina at Greensboro in partnership with the North Carolina Wildlife Resources Commission, and is funded by the U.S. Fish and Wildlife Service. North Carolina Zoo staff are assisting with the bat sampling effort. The NABat project uses acoustic monitoring to survey bats at various locations in North Carollina. Researchers use bat recording equipmentsometimes mounted on the roof of a vehicle known as the "batmobile"to listen for bats at night. Based on computer analyses of the recorded calls, they can identify the number and species of bats in different areas. By doing these surveys over the next few years, researchers will be able to learn how our bat populations are faring. The bat research project at the North Carolina Zoo is in its earliest stages; fieldtripEARTH will monitor the program as it moves forward.